If you were skeptical that Battlefield’s move to the urban streets would prevent it being the bombastic battle ground it has been previously, have no fear. There may not have been a tank in sight, but Battlefield Hardline is just as bombastic as it always has been. Just replace some of the explosions with wailing sirens and you’re almost in the right frame of mind. Shown off at the E3 EA press conference was a 32 player Heist game, Cops v Criminals duking it out in the streets. The criminals task was to steal an item from an armoured truck and get it to a helicopter extraction. The cops had to bring the noise and justice hammer down on them. Cue destructive car chases and baseball bats to the skull. Notable new elements seen in the explosive footage are tasers for police officers for those electrifying non-lethal takedowns, grapple-hook gadgets to climb up to ledges, zip lines between major buildings, and a range of civilian-style weapons for the criminals (sawn-off shotguns and baseball bats). Tanks and APCs are traded in for cop cars and other standard street-fare wheels, but helicopters still remain. It also looks like a range of other vehicles may be hijackable, as one player uses a petrol tanker to cause quite a hefty explosion. Levolution is still hanging around too, with a crane collapsing in Battlefield’s signature fashion. Visceral have also been working on a ‘fresh approach’ to Battlefield Hardline’s single player campaign, taking inspiration from TV dramas for it’s narrative rather than traditional shooters. 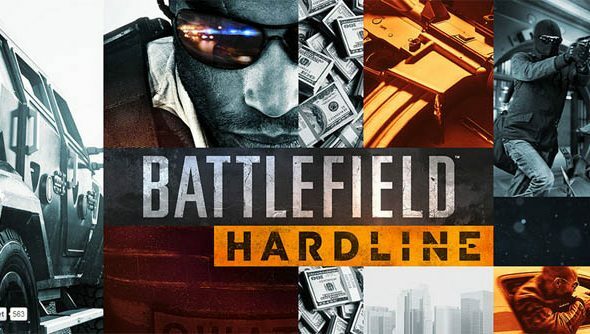 Battlefield Hardline releases October 21st this year.